Combined in a small area. Having all these environmental factors in a small area. In a historic production region of a state is how we are able to fill all tags we care to hunt for.Now we’ll try to show & tell. 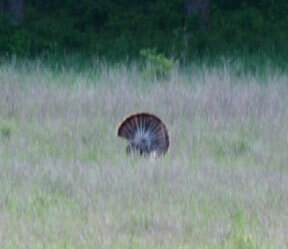 Prime hen turkey nesting cover is composed of tall or native grass. Combined weed areas especially such along a lightly brushed in tree edge. Pictured at right. Value of this habitat combination is after flydown, servicing, feeding, drinking, hens head to their nest site. Frequently dragging a tom along who may be called or decoyed to a more responsive appearing hen decoy set up. All photos were after spring season, taken in hind sight of article written during summer. Value this lease brings is its flock has had its roost, strutting and nesting area all on small acreage for six continuous seasons. Flydown field, a hay field, at right. 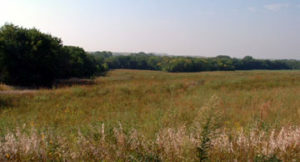 At right, tall nesting grass appears as a brown strip in far ground. On this side is a cut hay field where right after flydown hens, toms and jakes went to grazing. Toms to strutting. Hens to be serviced. On heavy dew or any wet morning all would range out farther, stay longer rather then head into tall grass too quickly. Farther down from roost is a year round water source. Water is sometime more rare than we would like. Turkeys will drink every day. It was not required during spring as its creek bottom had a flow. However along it is where we see a lot of tracks during fall. 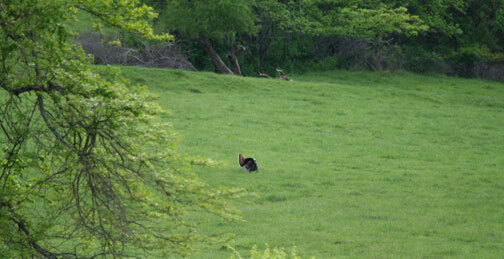 Probably begins to see a lot of turkey visits once this lease’s creek dries up during summer. A rather large adjoining crop field. For spring turkey hunting this crop field was never productive, however I suspect it serves to help anchor this flock to year round. A fall hunt would need to include it. We have seen varying numbers of birds feed on this field well after harvest while we were after deer farther down. Last time out we counted 38 birds, or what we could see at one time. 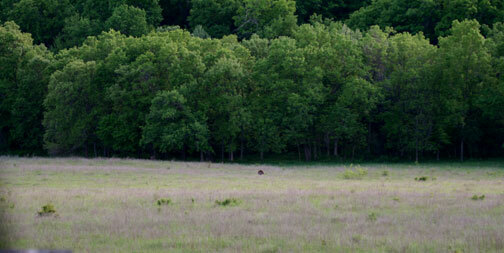 A long range panoramic shot of our deer spot, further down from roost and pond, backside of our property. Observing deer and turkey both during fall and spring is probably why we have done as well as we have. I no longer turkey hunt it for myself. It is almost cheating as my last two springs I hunted we did not go past 9AM. I now save your farm for when my son can join me during spring break. It is a great thing we can fill his tags in one morning. Then spend time together fishing or deer scouting, two activities I waited too long for us to get started on probably more so for all our talking we do than any thing else. As good as a pocket camera would allow. 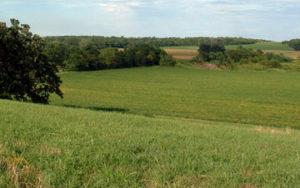 Pictures are of north central Missouri within the Grand River Watershed, second largest sub-basin in Lower Missouri River Basin. Locally well known spring turkey hunting region. A region in 55% agricultural land use. Plenty of rainfall to grow large grain crops of corn and beans. Supporting large flocks of heavy birds. Any bottom land will be in row crop. Ridge sides in pasture or wood lots. What is seen come from a fringe zone above bottom crop ground, before its timbered ridge. All of these turkeys were in pasture. 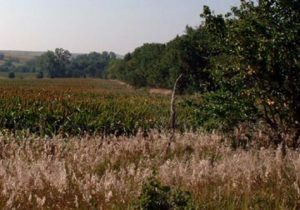 While it may appear we are beating a dead horse about our farmland hunts it must be restated for benefit of those traveling from big woods states. Our intent is to make as good of a hunt possible. That has been proven many times over by setup and call rather than run and gun. All may hunt their preferred technique. Our observations do show a difference just as these open ground birds readily show themselves. An exposed hunter is easily done long before getting into range. Timber seen looks more impressive in pictures than when sneaking through. Two toms on different spots. They were strutting in response to Jon Nee’s call, there was not another turkey in sight. It is well after spring turkey season. An attempt as much as can be made in pictures with text to help give an idea of some of the conditions to be expected.